My favorite challah recipe, adapted from Eveleyn Raab’s cookbook The Clueless Baker, is delicious on its own, but sometimes I like to jazz it up. 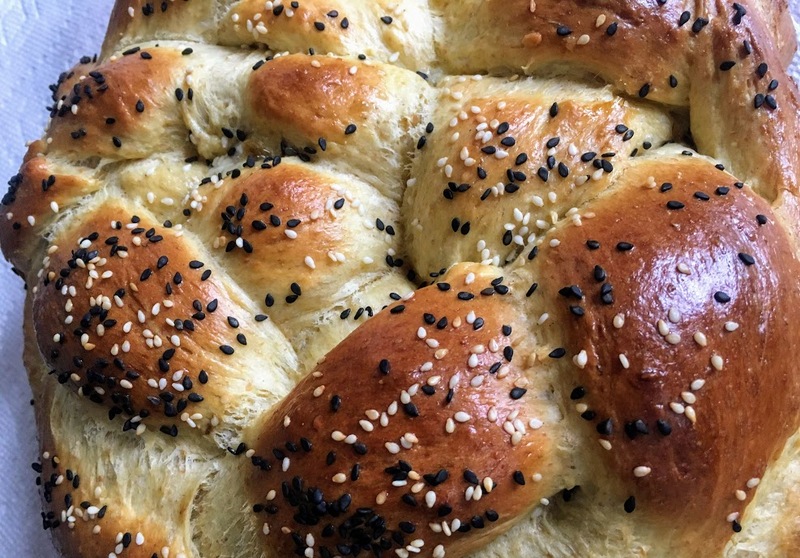 A few years ago, I added South Asian spices to form “masala challah.” Here, I sprinkled on black sesame seeds, which not only look stunning but add subtle flavor. When I first experimented with this recipe, I replaced some of the all-purpose flour with einkorn flour. This ancient variety of wheat gives the bread a golden hue and a rich, nutty, sweet flavor. A friend happened to have given me a bag of einkorn flour from a small, local farm as a gift, and I’ve been using it in as many recipes as I can, from this challah to flatbread to pancakes. You can purchase einkorn flour online, or swap it for all-purpose flour; feel free to try using regular whole wheat flour, but I find that commercial brands make challah very dense. Prepare the dough: In a large bowl, combine 2 cups einkorn flour, salt, sugar, and yeast. Stir in warm water, olive oil, and eggs until smooth. Add all-purpose flour, stirring until a soft dough begins to form. Directly in the bowl or on a lightly floured work surface, knead until smooth and elastic (the dough should spring back when poked,) adding more all-purpose flour as necessary if dough is too sticky. Place in a bowl, cover with a kitchen towel, and set aside in a warm spot to rise until doubled in size, around 30-45 minutes. Shape the challah: Lightly grease a baking sheet. Divide dough into 3 equal-sized pieces. On a lightly floured work surface, roll each piece into a rope. Transfer ropes to the baking sheet. Pinch one end of the ropes together, braid (for step by step directions, click here,) and then pinch the other ends together. To learn how to shape a round, braided loaf, see this video. Cover loosely with a towel or plastic wrap, and let rise for around 20 minutes. While the loaf is rising, preheat the oven to 375 degrees F.
Glaze, garnish, and bake: In a small bowl, whisk together egg and water. Using a pastry brush, glaze the surface of the loaf with egg wash. Sprinkle sesame seeds evenly across the surface. Bake for 30-35 minutes, until the loaf turns a deep golden brown and the bottom sounds hollow when you tap it with your finger. Let cool for at least five minutes before serving. Store leftovers at room temperature in an airtight container or ziploc bag.